Enough with the plastic bags. Quick fix: Reusable snack bags. You want to make your lunch for work to save money or bring in a few snacks- I get it, I do it. At first I tried to reuse the ziplock but then washing it was a pain. 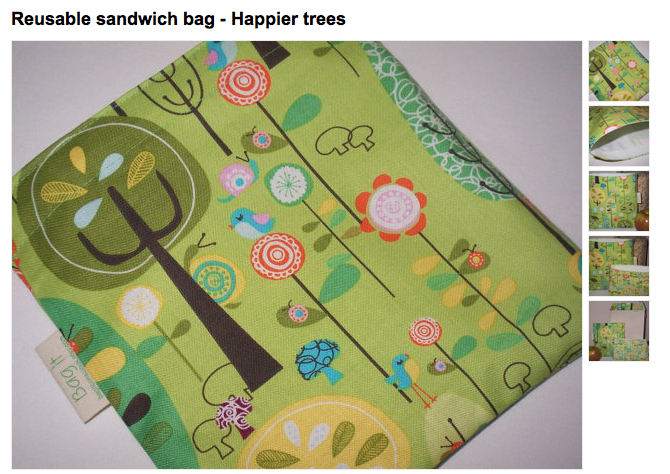 Then I found awesome handmade reusable snack and sandwich bags for $7 or even less on Etsy. Check out BagItConscious for some fun prints and patterns. These bags are awesome for Moms on the go with little ones needing lots of snacks AND for those of us that just like to have a snack close by..just in case.. Thanks for the link! We usually use foil on sandwiches and I try to use tupperware for everything else but bag lunches can quickly become way too bulky that way. This is exactly what I’ve been looking for!